March 24, 2019 – The U.S. Air Force’s Space and Missile Systems Center’s Global Positioning Systems Directorate achieved another major program milestone March 19, successfully delivering the second GPS III Space Vehicle to Astrotech Space Operations in Titusville, Florida to begin satellite launch processing. The satellite, dubbed “Magellan” in honor of Ferdinand Magellan, the Portuguese explorer who led the first expedition to circumnavigate the Earth, was transported in a custom container from the Lockheed Martin factory facility in Littleton, Colorado to the Space Coast Regional Airport in Titusville, Florida, by a C-17 Globemaster III originating from Shepherd Field Air National Guard Base, West Virginia, 167th Air Lift Wing. 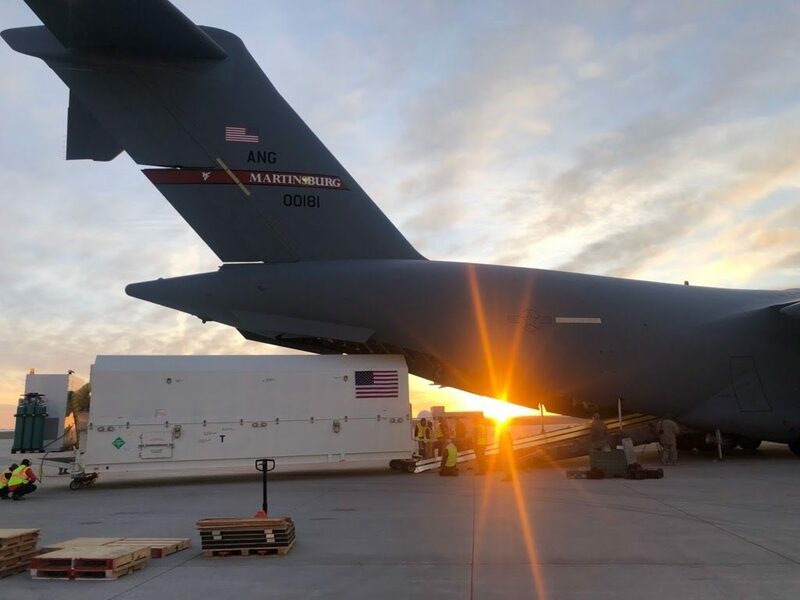 The transportation crew consisted of both contractor and government personnel who oversaw the entire operation to ensure that the conditions of the transport environment would not damage any of the satellite’s sensitive components.